The 2003 Lymm May Queen Grand Parade was led by Peter Powell, Town Crier for Lymm & District. The Parade looked wonderful although it was a dull but warm, fine day. The May Queen-elect this year is Amy Glover and she has taken over from retiring May Queen Sarah Eadon who presented the crown. The Rosebud-elect is Charisma Mitra and she has taken over from retiring Rosebud Louisa Bannister. 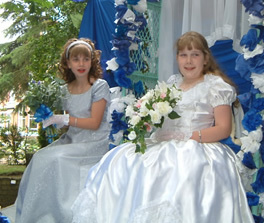 The crowning ceremony took place on the May Queen field. The Ladies-in-waiting are Fay Williams and Jessica Simmons. Crowds gathered to watch the parade and crowning ceremonies. The field hosted lots of side stalls and refreshments. The children and adults were left aching with laughter from the entertainment by Bozo and Zizi, the clowns with exhibitions of stilt walking, juggling and lots of tomfoolery. The music was provided by Warrington Latchford Silver Band, Lymm Samba Band, Warrington Juvenile Pipe Band, Warrington Brass Band and Bootle Concertina Band. No May Festival could be complete without the May Pole Dancers giving a modern version on a traditional theme, even though it is June 14th! Thanks to all who took part and the organisation committee who made the event a memorable success. Don’t forget the next big event is The Lymm Festival 26th June – 6th July 2003. Thanks to all the public for their ongoing support to make our village great.